Each year major league baseball welcomes a new crop of first-year players (rookies) who arrive on the scene with promise and a scrapbook full of minor league clippings that excites their franchise and faithful fans. Some of these rookies find their way into the line-up or rotation and have an immediate impact. Others, not so much. And then there are those who show up with a lot of fanfare and never make their mark in the majors. That is certainly not the case for Chicago White Sox rookie Jose Abreu. The 27-year-old rookie first baseman has been as close to the “real deal” as any first-year player this season and maybe in the last 10-plus years. On Sunday he slugged his 35th HR, tying the White Sox rookie record. In addition, he has already surpassed the 100-RBI mark. That’s where we want to jump off in this conversation. Abreu became only the 12th player in MLB history to have 30 or more HRs and 100 or more RBI in their first season in the majors. Abreu joins an impressive list. The last player (rookie) to accomplish this feat was Albert Pujols who had 37 homers and 130 ribbies in his rookie campaign with the Cardinals in 2001. Another reason Abreu’s season is so remarkable is when you compare his stats this season to others in the Class of 2014. Only three rookies have had 10 or more HRs and 50 or more RBIs this season. In addition to Abreu, Houston’s George Springer has 20-51 (as of Sept. 14) and Detroit’s Nick Castellano has 10-59. 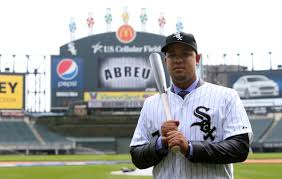 Their numbers are a long ways from the numbers Abreu has put on the board this season. Here’s a look at the 12 rookies (including Abreu) who had 30 HRs and 100 RBIs in their first year. Note: One rookie, Willie Montanez of the Philadelphia Phillies in 1971, fell one RBI short of making this list. He ended his first season with 30 HRs and 99 RBI. A few others rookies were pretty darn close. They include: Ryan Braun (2007, 34-97), Nomar Garciaparra (1997, 30-98), Tim Salmon (1993, 31-95), Willie Horton (1965, 29-104), Luke Easter (1950, 28-107) and Joe DiMaggio (1936, 29-125).